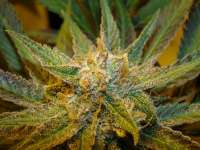 Here you can find a strain description about Krakatoa and also some user-based reviews and infos directly from the SeedFinder (if available). You can also find the offers and auctions here if Krakatoa cannabis seeds are on stock at MyCannapot right now. We bring you our new cross called Krakatoa that is simply delicious, we took a nice female fruit loop haze from our brother krip keeper stock and crossed it with our beautiful Mau-Mau dad, the result is mouth watering. Krakatoa flowers in only 9 weeks, with an average yield but top quality smoke. The smoke is very fruity (grapefruit/mango/lemon), once dried and properly cured, Krakatoa will soon become your favorite jar to choose from. Excellent plant for SOG setup, minimal stretch at flowering. Krakatoa is not available at our shop at the moment!